Snacks are an inevitable part of meal at home and being a blogger,opened up lots of opportunities to try out different types of snacks,cake,cookies and many others.Now a days,I hardly rely on store brought snacks and preferably try out some healthy chaats,fried or baked snacks.Today's post is also an interesting yet healthy as it is a steamed pancake with a spicy fish filling.Meen Pathiri is a popular and authentic recipe from Malabar region of Kerala.This is a speciality during Muslim weddings and in Iftar menu during Ramadan.This can be served as a healthy steamed snack or as a dinner too.The aroma of the spicy fish masala itself makes it mouth watering and delectable with a steamed rice cover.I have tried the ari pathiri and irachi pathiri sometimes earlier and this time tried out these meen(fish) pathiri.I have used king fish in this recipe but you can use any firm fish without much bones to make this recipe.Though the recipe is a bit long and may take up time but is worth all the efforts.Do give this a try if you haven't tasted yet and enjoy !! For marinating and frying fish- Rub the fish with salt and lemon juice,leave for 15 minutes to remove any odor.Wash under running water 4-5 times,drain water and leave aside.Make a paste using the ingredients listed under marinade except oil and rub the fish with the paste.Leave aside for 45 minutes to an hour.Heat oil in a pan and shallow fry the fish pierces until crisp and golden brown.Drain and leave to cool.Gently remove the bones off and make small pieces.If using fillet,omit this step. 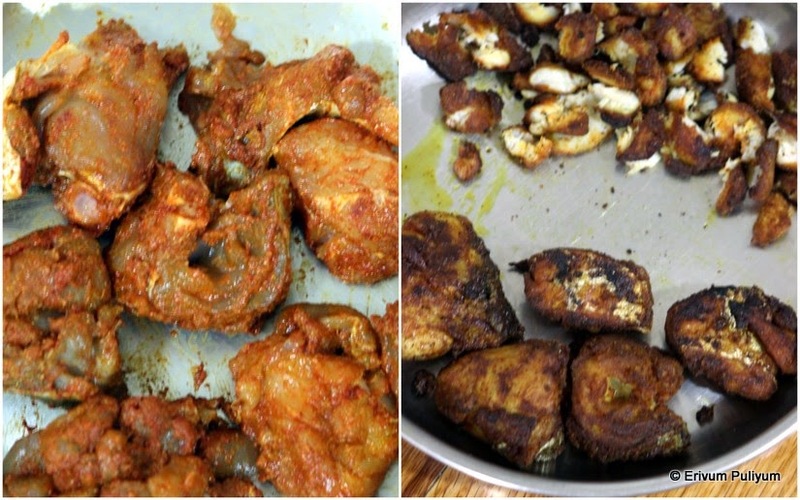 For making masala- Either use up the remaining oil after frying fish or use fresh oil 2tbsp in another pan.Add the onion and saute until it becomes translucent.Add in ginger-garlic paste and saute till raw smell disappears.Add in the spice powders-chilli powder,coriander powder,turmeric powder and saute till you get a nice aroma of spices on low flame.Add in chopped tomato and cook well.In the meantime,grind the coconut with fennel seeds,shallots and water to a smooth paste.Add this paste to the cooked tomatoes.Mix well and let it cook for 3-4 minutes until raw flavors disappear.Add in the lemon juice,garam masala & chopped leaves;cilantro,curry leaves and mint leaves along with fried fish pieces.Add 2 tbsp of water,adjust salt and cook covered for 5-6 mins on low med flame to get a thick coated masala(not watery).Switch off flame and keep covered. 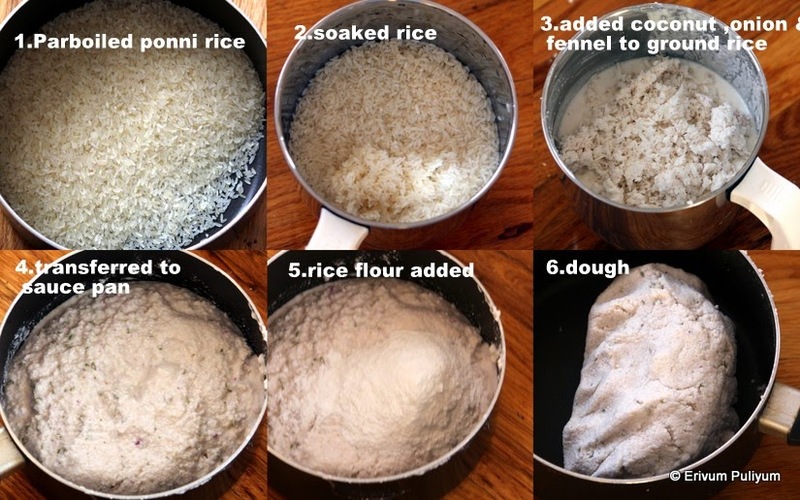 For making pathiris- Soak the rice before hand overnight if using parboiled rice or 4-6 hours if using pachari or long grain rice.Grind the rice with minimal water and get a grainy texture(about 3/4th done).Add the grated coconut,onion,fennel seeds,salt (listed under pathiri) and coarsely get it ground.Tip it in a bowl and add rice flour.The water in the ground mixture should be absorbed by the rice flour and make a soft dough or a dough that can be shaped in balls.Make even number of balls(I got 12 balls). Take one ball,place it on a banana leaf or square cut baking sheet paper.Flatten it using your heel of the palm until thin and round.Place about 2-3tsp of masala and leave a centimeter distance around the circumference.Take the second ball slightly larger than first so that it covers the masala fully(I made 6 balls of equal size and the other 6 balls slightly larger than the first 6 balls).Now place the ball on another sheet of paper and flatten the similar way. 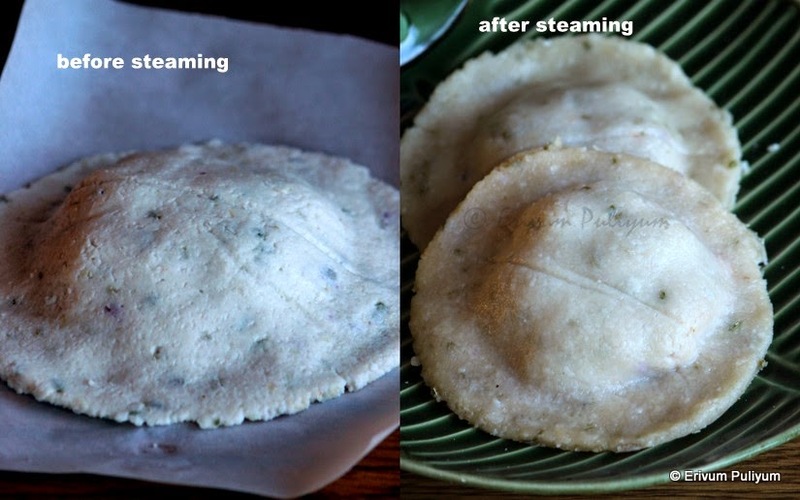 Turn it down over the other pathiri with filling and peel the top paper.Gently press the sides so that its sealed well.Place a steamer with water on heat and place the prepared pathiri with baking paper/banana leaf in steamer and steam cook 7-8 minutes until done.Repeat the same process till you finish all balls. 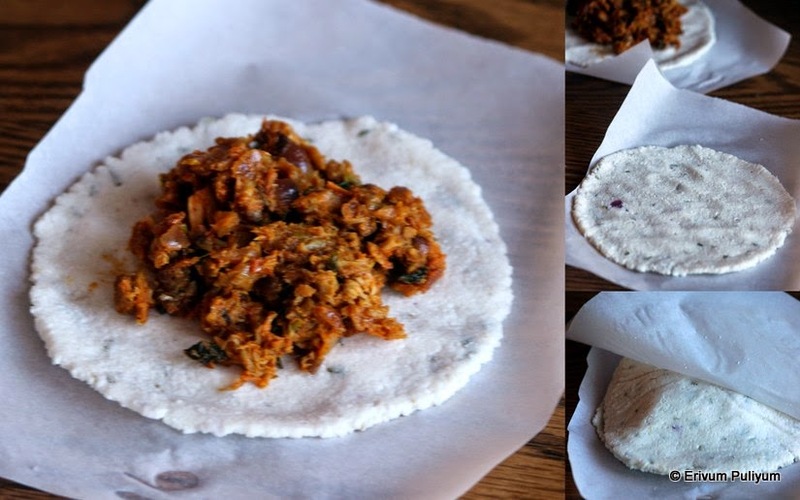 * You can use puttu podi too. * Try getting the sides of the disc thinner so that its cooked evenly.Also leave lesser space than that I have left. * I have used Ponni parboiled rice and so the color of the pancakes is off white,but the ones made with pachari(long grain rice) will be pure white in color.Taste and texture wise parboiled rice works good. This looks awesome, Julie! I am coming there right now. Oh dear, I'm amazed. Lot of work, but it is beautiful, healthy and I imagine, delicious. Very new recipe to me.. looks delicious.. I have never tasted Pathiri even though I lived among Keralites for many years. Is it typical to any community cuisine? And is there a vegetarian version to this? Do post if it exists. I get the readymade Pathiri powder here. Will give a try. Can we use potatoes with onion and tomatoes? I know I m asking too many questions. Lovely pictures Julie. I m sure your family enjoyed. nice, i can stuff some green veges. Love these cute, tasty fish filled delicious pancakes!! !Wish I could grab just one at least! I've never had this, looks so good! fantastic recipe..full of flavors Julie..
Looks pretty good..never tasted it! !so send it across!! Wow, Julie...this looks amazing. Definitely gonna try this over weekend or sooner :) So yumm! Oh nallaa neimeen kandittu thanee kodiyavunnu.If I was standing beside u while frying I doubt u would get anything for the pathiris..Kidilan pathiri. Sure Julie. Will give a try. Any suggestions on what Vegetables i can use? I assume that the meat and fish filling are tart. 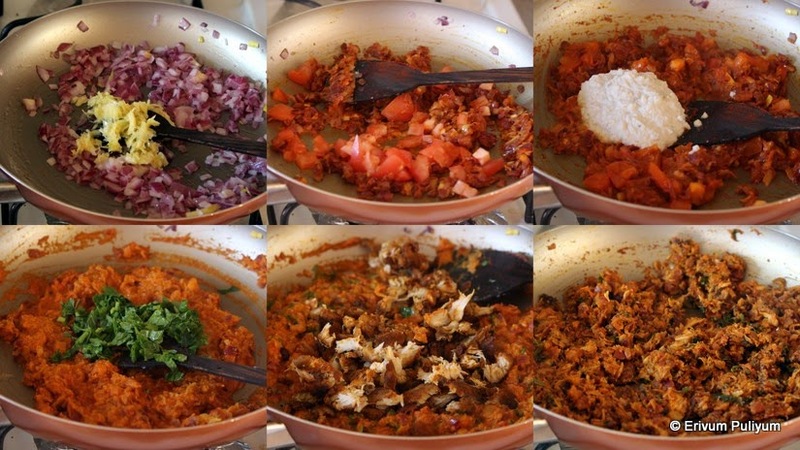 So, will Onion and tomato masala stuff work? Just a guess.